As a puppet creator, Ronnie Burkett has been an inspiration for me since my very beginnings, when I saw incredibly high quality photographs of his beautiful puppets on a Canadian theatre's website. It was years before I was able to see one of his shows and meet him, but even as I was reading about his work, I was learning from his contributions. It is a great pleasure to have the chance to ask these questions, and share Mr. Burkett's answers with you. and inspirations. What were yours? My “addiction” and love affair with puppetry began at the age of seven. Several things converged at once as culprits in this obsession. The film version of The Sound of Music came out that year, and the puppet sequence by The Bil Baird Marionettes totally captured my imagination. The World Book Encyclopedia featured a two page entry on puppets, and there was a photo of the Bairds surrounded by marionettes; this, to me, was pure magic. And, that year, my parents gave me a little lion handpuppet for Christmas, and my second grade teacher let me put on a rambling improvised version of Red Riding Hood (the lion appearing as the wolf). The fascination was immediate, and continues to this day. 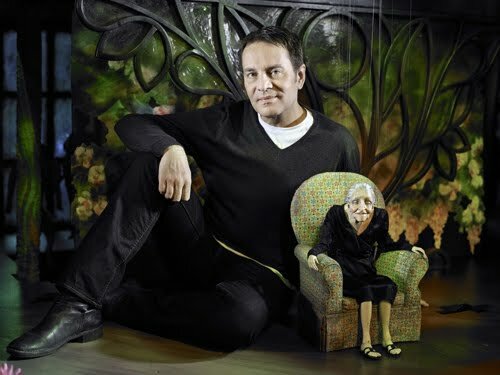 In a question period after a show, I remember you telling a story about how you went to your first puppet festival. Can you indulge us in a brief retelling? I grew up in a small city in western Canada. There were no puppeteers, and no touring puppet shows. I didn’t actually see a live puppet show until I was in my teens and already touring my own work, at a Puppeteers of America Festival in Michigan. So, between the time I first discovered puppets and getting myself to that first Festival, I read. I read everything related to puppetry I could get my hands on; it’s the singular reason why I could sit down and doodle a dozen different ankle joints for you. Or elbow joints. Or neck joints. Or half a dozen different techniques for making plaster molds. 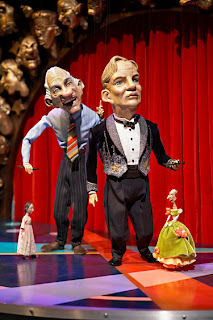 Or tell you the shared history of Guignol, Kasper, Punch, Karagioz and the other bad boys. So, by the time I got to meet my idols in (American) puppetry, I was able to parrot their careers back to them, show them a portfolio, ask them specific questions and honestly, it allowed me to worship them fully, simply because I had memorized everything I could find about them. There was nothing particularly notable or unique about me when I was a teenager, but I had a huge vocabulary of my craft, and I think that allowed me entrée with the people I longed to know. And a few of them were lovely to me. Not all of them, oh no, but a few became heroic, flawed, generous mentors who still inform my work and my life to this day. Puppetry Artists may be bringers of stories, dreams and inspiration, but sometimes we forget there are some more tangible aspects, actual dangers to our health and well being. Is this a concern for you? Tandem to the rise of puppetry’s popularity in the early and mid Twentieth century, a lot of new products came on the market, which puppeteers were eager to experiment with. Plastic wood and (later on) celastic were especially popular, both of which utilized acetone in their manufacture or use. I love seeing the old plastic wood heads on marionettes; it was one of the first materials I was taught to use, although the formulation of it was already being changed when I was young. No one I encountered used masks and gloves to work with these materials, in fact, many would smoke with the ashtray sitting beside the open can of plastic wood or acetone. This is, of course, unbelievable to us today, but we must remember that even into the 1960’s television advertising for cigarettes told people that smoking was good for them! I think the twentieth century was about the open embracing of all that was new; very few sat and pondered the ill effects of “the modern age”. Personally, I had to make my studio and my practices less toxic, primarily because I do employ others to assist me at times, so I am responsible for them. And I just hate working with a Darth Vadar-like filter mask on, that really kills creativity! I was taught by some of the old puppeteers, so naturally I was taught to use some of those materials, but since they are no longer available in their original form, I haven’t used them in years. as the price to pay, to be able to do the work? Many people, by isolation or lack of information or skill, just “make it up” as they go along. And there is a lot of old information floating around puppetry; some of my favorite books on the craft are now are 40, 50, 60 years old. But I find that people working in “traditional” or more sculptural forms of puppetry tend to have slightly better practices, inasmuch that carving has a historical practice to it, an ethos, if you will. Same with traditional mold making skills and so on. The puppet makers I worry about most are the ones working in foam and contact cement. I think there are a lot of hobbyists out there sniffing glue while they make their TV-style puppets. It’s an interesting discussion though, because there just isn’t a better way to glue foam than with shoemaker’s contact cement. So, should we use it or not? I am a huge fan of knowledge, of training, of discipline. I don’t ultimately believe in “accidental art”; that’s actually anathema to my view of puppetry. The more one knows about their material, the better the relationship. And yes, some relationships are toxic. I don’t think we can avoid it in the world we’ve created for ourselves. We can control our choices somewhat – and I think we must in our work - but there are roughly 96,000 chemicals used in everyday products (perfume, plastics, deodorant, insulation, you name it) that have never been tested. Never. So, yes, let’s put a mask on when sanding, and yes, let’s smarten up about solvents, but this notion that we can live and work in a non-toxic world is, I think, simply impossible. I suspect the food containers most people put in their microwaves are as bad for us as a can of acetone. And just to be a bit extreme here, and yes, possibly controversial, some of the craftspeople I know who are the most militant about health and safety practices eat meat, are obese, drink cola, never take public transportation. I think a discussion about a solvent or a glue being bad for you is a mute point if you’ve just ingested chemically altered animal flesh or driven a car to work. The major health choices I’ve made for myself are actually not based solely upon my studio work, they’re based upon a social conscience, as well as a need to keep my body in better form as a puppeteer. Back in the 90s, you wrote Paper Mache Rediscovered, an article that became an often- referenced online resource. How were you first introduced to the mysterious world of Paper Mache? Paper Mache has always been around puppetry, and I’ve been around puppetry most of my life, so we were destined to meet. I used it as a child - the very crude version of newpaper and flour paste - and found it messy, lumpy and quite ugly. To be honest, I wish I’d stuck with it (no pun intended) longer when I was a kid; years later, seeing the masks of Benda and the marionettes of DoLores Hadley, I was absolutely amazed at the extraordinary possibilities of paper mache. But too, my mentors weren’t really using mache themselves, and people teach what they know. When I was in my mid-20’s, I met the great American variety marionettist Frank Paris, and he was experimenting with homemade paper pulp, his recipe for which he passed along to me. My connection with Frank re-awakened an interest in the possibilities of paper in various forms. Interestingly, he had worked with Dolores Hadley around the same time; I wish I would have met her. 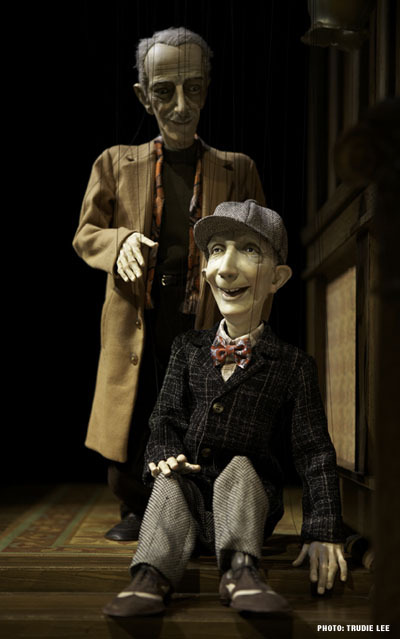 Her marionettes thrill me; fully paper mache, made from brown paper towels directly overcast on plasticine. Mind you, regardless her medium, her design approach, her sculptural ability, painting and costuming were spot on. That her work was paper mache makes it even more appealing, I think. Funny you mention that article I wrote. It was something I wrote for a specific small audience, probably in 1992 or 93. I had no idea it would get around as much as it has, never mind still be out there. I’ve learned so much more since then; the article still has a lot of sound info, I think, but it’s already dated in terms of my own play with paper mache. or learning techniques that were proven to work? I have a lot of books on puppetry, probably 1300 at present. I’ve also collected books on craft techniques, paper mache among them. I had some time on my hands one summer between tours, so I got a lot of the old books out and started comparing varying techniques. You know, most “how to” books on puppetry are crap or written by amateurs. And so the information was at times quite contradictory; some said to shellac a plaster mold, others said don’t. Some said to soak paper strips, others not. And so on. So, like all things in life, I just sort of trusted the better opinions and my own instincts and started playing. And it was very satisfying. I was keen to find a dependable method of casting in a mold, no fancy papers or glues or mold making materials; and I came across a method of casting the whole paper strip head (minus a cap piece) in a plaster mold at once, resulting in far less warpage of the puppet head. And best of all…that summer was a lot of fun. It really was like being a kid again. That’s something I try to tell people. Paper mache is very enjoyable. The stakes aren’t so high…no costly materials, no toxicity to worry about, plus you get your hands mucky and make something. What could be better than that, huh? Do you use commercial products, or prefer making your own? I use Paperclay quite a bit, as well as Celluclay. The late American doll artist Robert McKinley introduced me to Paperclay, with an offhanded remark, “It can’t be cast for duplicate heads, so it’s probably of no use to you”. That remark set me on a period of experimentation, and I eventually settled on a technique I still use to this day, involving rolling it out, freezing in rubber or silicone molds and baking. For larger pieces, I would absolutely use strip paper in a plaster mold or direct overcast, but for my finer, smaller heads, Paperclay captures the detail beautifully, while still retaining an essentially paper base. I personally love Celluclay; we use it a lot as a mold filler, packing hollow parts that need a solid core, or for rough textured props. I’ve also made puppet heads from it, personally quite happy with the rough texture. I used to make a lot of my own pulp, which as a process I find quite enjoyable. But if we’re up to our eyeballs in the studio (which we usually are), it’s just easier and faster to mix up some Celluclay. We also mix Celluclay and Paperclay together and sculpt marionette hands over a wire armature. It’s very strong, yet still allows a great amount of detail and delicacy. Another commercial product that I’ve found handy to have around is simple powdered craft art paste. I’m personally not a fan of using white PVA glue in paper mache. I find that it “plasticizes” the mache, and I loathe that. Such an awful surface to paint, not to mention that it’s contrary to the basic idea of how paper best marries itself into a sculptural form. I do tend to rant on about this, but I’m alone it seems. The whole world seemingly dumps PVA glue into their mache mix. Mind you, the whole world seems to love plastic. I have puppeteer friends who love love love their expensive toxic plastics and rubber and resins. They come from the school of “slick”; the smoother the puppet, the better it is. Now, I like some of that work, I do, but overall I’m personally drawn to the texture and feel of paper, be it strip or pulp. My favorite part of puppet building is painting, and painting a paper mache head – strips of Kraft paper, homemade pulp or Paperclay, doesn’t matter which – is endlessly fascinating to me. Not so the resins and the plastics. I experiment a lot with painting techniques. Right now I’ve come up with a method of using multiple coats of shellac and oil colours, which result in a depth and glow I love. I suppose I could utilize this technique with other materials, but there’s something “honest” about paper strips and pulp, and the painting of it becomes a true part of the material, not just a layer of colour on top. Do you still find difficulties /limitations about it? Of course. The puppet builder’s curse is always “not enough time”, and paper likes to take the time it takes to dry, be it strips or pulp. And humidity, well, add that to the mix and it’s another bother. I was concerned the mache heads and torsos for the Billy Twinkle cast would warp with the climate changes our cargo goes through, specifically shipping everything to a place as humid as Australia. So we shellacked everything, inside and out, and made sure it was sealed properly and impervious to moisture. The added bonus was discovering that lightly sanded shellac is a fantastic base for oil painting. I think if a person wants “perfection” repeatedly, strip mache may not be the way to go for duplicate castings. But if one is interested in the intrinsic properties of the material and finds them exciting to work with, then “perfection” isn’t such a big deal. More and more, I’m falling in love with the imperfection of mache, if that makes any sense…even though I’m capable of making mache look “perfect” if need be. I think paper mache still gets a bad rap, or is looked down upon, simply because a lot of people don’t take it to the next level. It’s fine to wad some newspaper up, tape it together and slather it in white glue and paper, but seriously, that doesn’t always result in the best work. It’s immediate, to be sure, but often looks it. The other problem mache has is the notion that it’s not capable of being beautiful. There are lots of paper mache dragons and trolls to be seen, but I think craftspeople naturally assume the material can’t produce delicacy. It can, of course, and there are extraordinary examples of this, but it usually requires methods a bit more precise than the wadded up newspaper version. But, like any material or method, it’s limited only to the vision, talent and skill level of the artisan tackling it. And as I’ve mentioned before, in the hands artists like WT Benda or DoLores Hadley, paper mache is a stunningly refined material. Is it still an important medium in your practice? Yes. And I think, over time, it will gain even more importance. I’m interested to explore creating entire figures solely from strip paper mache. Mathieu, I’ve played a bit with your technique using paper coffee filters and I love it. It’s a perfect mache paper. I’ve actually been rinsing out and flat drying used coffee filters for months now; I have a huge stack of these funny looking paper tortilla shapes just waiting for me to make puppets from, all softened up from a good brew of coffee! Also, if I were ever to write a “how to” book of my own, I’d want it to focus on design and balance and the best construction (jointing) methods, but downplaying all this mystery of toxic and costly materials. 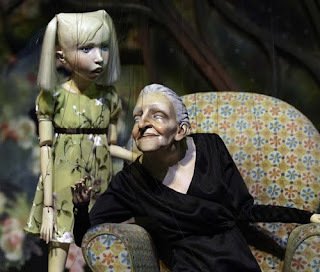 I’d love to be able to show how a jaw-droppingly beautiful and functional marionette can be made for well under twenty dollars. Hell, under ten dollars! Five dollars! We need to make puppetry about other things – text, design, brilliant performance skills – and stop this love affair with expensive materials once and for all. The cost and difficulty of a material does not a better designer make. Can you give us a sneak peak at your upcoming show? After the very “puppety” look of the Billy Twinkle cast, I wanted to get back to a more refined proportion and movement in my marionettes. I made a pilgrimage to the Detroit Institute of the Arts, where I was able to see a few of the remaining figures made by my chief mentor Martin Stevens, who, with his wife Olga, did adult drama in the 1930’s and 40’s with some of the most breathtakingly elegant marionettes I’ve ever seen. Seeing their Joan of Arc, Cleopatra and Christus figures again inspired me to try for an overall gracefulness and refinement in my next show, Penny Plain. And it’s a big show, at present count there are 40 marionettes, with several characters represented by five marionettes each. I chose to cast heads and torsos from Paperclay this time around. requires me to build a better story and better marionettes, but really, isn’t that the whole point? So, my most audacious act will be to do a puppet show. And the challenge will be to make those damn puppets appear to breathe and think on their own. But that’s always been the challenge, and it is all about technique. Oh, and I’ve devised a fantastic new marionette neck joint. If it works, I’m gonna be the proudest Geppetto on the block. Cross your fingers. Update: Penny Plain is still touring in some places. And, Ronnie has a new show. Please visit Ronnie's website for more information. And, he DID succeed with the new marionette neck joint.